The Clear Lake Trowel & Trellis Garden Club donate two Bradford Pear trees as replacements for trees which had died at the Park. 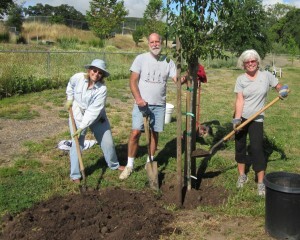 These trees were recently planted in the dog park by Garden Club member, Leanne Harvey and Westside Community Park Committee members, Cindy Ustrud and Dennis Rollins. Harvey was instrumental in arranging this donation.